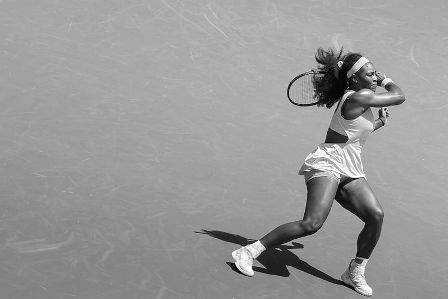 Last week, tech magazine Wired announced that the current issue of the magazine would be guest edited by Serena Williams. Undoubtedly one of the greatest athletes of our time, Williams mentioned the significance of the Rooney rule in the NFL, which requires the league to interview minority candidates for senior positions. She also notes that this procedure is touching other fields, including the technology sphere, which has been notoriously hostile to women. But we need to see more women and people of different colors and nationalities in tech. That’s the reason I wanted to do this issue with WIRED—I’m a black woman, and I am in a sport that wasn’t really meant for black people. And while tennis isn’t really about the future, Silicon Valley sure is. I want young people to look at the trailblazers we’ve assembled below and be inspired. I hope they eventually become trailblazers themselves. Together we can change the future. Though you won’t find much crossover between professional sports careers and careers in the technology industry, they do have one thing in common: they have been historically hostile to women and people of colour. Professional sports have a notable toxic relationship with the marginalised populations that inhabit the sphere. Williams herself has been the unfortunate recipient of misogynoir, earning less money in endorsements than her white colleagues despite being one of the greatest athletes alive. Professional women’s soccer players make anywhere from $6,000-$30,000 annually, while men make an average of $207,000. In 2013, the manager of the Australian national soccer team quipped that he advised ‘women should shut up in public.’ And sports journalism is rife with misogynistic insults toward female writers. Despite these pitfalls, many women are braving their way through the sexist drivel and unfair wages, which have resulted in numerous milestone occurrences, paving the way for greater acceptance of gender and race within the world of sports. One such occurrence happened earlier this year when Jennifer Welter became the first female coach in the NFL, as she helped to guide the Arizona Cardinal’s inside linebackers through training camp. Through this accomplishment, she effectively smashed through a glass ceiling that had previously been unscathed. Of course, her amazing success is the result of a lifetime of hard work and dedication to the sport. Welter has an impressive 15 years of semi-pro women’s league experience under her belt, and four Women’s Football Alliance championship victories to prove it. She’s also dabbled with playing with men in a full-contact, non-kicking position. Impressive for a woman of her stature, considering she is 5’2” and 130 pounds. I grew up in Vero Beach, Florida, where football is kind of a religion. The whole town shuts down for games, and we would all go. I played other sports, like tennis, and team sports, including rugby, in college, but I was just fascinated by football. Right after I graduated, I went to an open tryout for a women’s team, the Massachusetts Mutiny. And I realized, “This is where I’m meant to be.” There wasn’t any thought about a career path with the NFL. We’d joke that it was the No Female League. So when I got the chance to coach this past preseason with the Arizona Cardinals, it was always strange to me when people would say, “You’re in the NFL now, you’re living your dream.” Well, no, this wasn’t a dream I was ever even permitted to have. I think that part of what I’m most proud of is that now other little girls can have that dream. Clearly, even for Welters, an incredibly talented athlete with a devotion for the sport, landing a coaching position in the NFL was something she wasn’t even aware was possible. Through her employment she’s quite literally changing the scope of what people have perceived was possible. Women have been digging their way through the trenches in other largely male-dominated professions; the US has seen an increase in the fields of firefighting, police work, and construction. But the lack of women in the technology sphere makes headlines constantly. And as Williams points out in her piece in Wired, there needs to be representation for people of colour and women in the industry. Women have made significant advancements in the technology sphere already. We wouldn’t have set foot on the moon without Margaret Hamilton’s work in coding, but in the fifty years since that achievement, women’s participation in computer science has gone through an interesting transition. In the early 1980s women held 37.1 percent of the positions in the computer science field, but with the spread of home-based PCs, the number of women in computer science positions decreased significantly. Today, women who pursue an education in technology fields are leaving nearly as quickly as they come in. My daughter was never into combing dolls’ hair and playing with Barbies. She was into Legos and building things and playing with her Game Boy. By the time she was in middle school, she was old enough to go to an overnight summer coding camp. It was life-changing for her. She loved it. But the thing I noticed at the camp was that there were very few girls in the classroom. And there was one student of color. That was her. It really resonated with me because, growing up, I was a tagalong little sister who always wanted to prove that even though I was a girl, I could do things my older brother did. He was a techie, so I made myself get involved with tech too. And he hated it. He just didn’t welcome me following him around, trying to play videogames with him and his friends. But I stuck with it, and by high school my guidance counselors said engineering might be a good career for me. They both were black women who really helped me to set high expectations for myself. Having those mentors was absolutely key for me. I don’t know that I could have done it without them. So seeing my daughter’s camp was a wake-up call. I didn’t want her to lose this interest in tech just because the only other kids who were interested in it were boys who weren’t inviting her to the circle. That led me on the path to creating Black Girls Code. Though professional sports and technology are on opposite sides of the career spectrum, they have historically shared the same unwelcoming environment for certain groups of people. While this is slowly changing throughout both fields, it is important to recognise and appreciate the women and people of colour who have helped pave the way despite tremendous odds. With any luck these industries will begin to adapt and accommodate a more diverse workforce. Until then, we have an awe inspiring group of trailblazers to look up to. This entry was posted in Featured and tagged diversity, sports, technology. Bookmark the permalink.